Hello, hi. 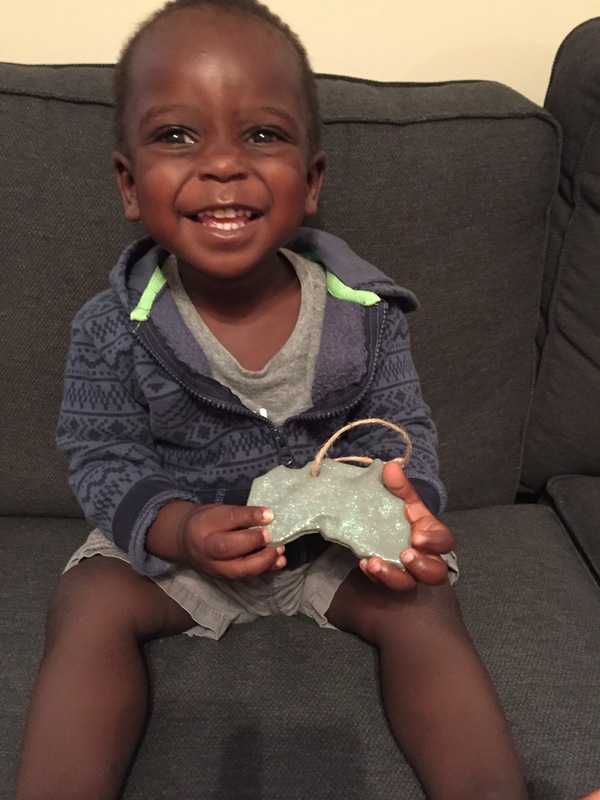 If you’re just joining in, we’re in the process of adopting kiddo #2 from Uganda. You can read more about that here. We’re also fundraising. And all the people said, Hooray. You can read more about that one here. One hundred and fifty seven (157!) puzzle pieces are gone. Like, paid and accounted for and GONE. That’s a whopping total of $4,710… almost the total of our first agency fee payment. (Insert all the praise hands.) What in the actual world? People are so kind. People are so generous. People are so good. They really, really are. Dustin and I are so grateful for the people who are choosing to rally around us financially right now. We’re honored and humbled and just so stinking thankful. The notes and text messages and emails that have come along with each donation have left me in tears exactly every time. We’re so proud to have each of you in this village. We really are. Do I think we can sell the remaining 593 puzzle pieces? Funny you should ask. That puzzle remains in it’s original bag, unopened, with the receipt attached to it because no, I’m not totally sure we can. It’s just so many. That number is ginormous, ya know? But we’re still believing and praying and hoping because that’s the only thing that makes sense right now. If you want in, we’d love to have you. You can click here to donate, you can email me to get our address, or if you’d like a tax deductible way to give I can give you our agency’s address as well. $30 per puzzle piece, $120+ gets you an Africa Christmas ornament Wyatt helped make. The first round of those are packed up and ready to go! We’re having to make many more batches because y’all are so good to us. Really, it’s humbling. Thank you times a trillion. Let’s keep this thing going, shall we? Several weeks ago, like long before we knew we were for real about to do this thing, I had some burning thoughts about adoption and fundraising. Dustin and I talk about it often- how grateful we are for the people who financially rallied on our behalf- because if it weren’t for them Wyatt wouldn’t be here. Like, he literally wouldn’t be here. He would be with another family who had the money and that would be that. We talk about how brave people were to open up their wallets and buy into a story that hadn’t even really started yet. We talk about how kind and generous and thoughtful people were with their money. Sometimes I just get overwhelmed with it all, the fact that Wyatt is here and it’s only because so many people helped make that happen. And so I scribbled down some thoughts and shared them with our people, because I so honestly believe them to be true. Hands down my favorite thing about life right now is getting to introduce Wyatt to the people who took a risk and literally bought into this story at some point over the last two years. Last night as we hung with a college friend who has her name on the puzzle in Wyatt’s room, I was yet again reminded of how proud I am. Proud of who Wyatt is and so proud of who our people are. My heart could explode thinking about having a whole new round of people rallying around a whole new kiddo all in the name of family. Like, for real, it could actually burst. I also can’t wait to introduce y’all to him or her. What a gloriously fun day that will be. This is Courtney. I’ve been quiet for a while but I’m back. In Kaihura, the word for “thank you” is “Webale” (weh-BAH-leh). It was one of the few words we learned before we went to Uganda. Dustin and I have been meaning to write a “Webale” post for a while now but just haven’t. Sometimes stupid things get in the way. But today is the day and we want to take a minute to say “webale” to y’all. A couple of weeks ago we had a fundraiser at a local ice cream shop where proceeds from the day went to our Know Think Act project that is getting new clothes for Christmas for the kids at the orphanage. The day exceeded my expectations and kind of let me down all at the same time. It was a day that we felt God nudge us to do. It was a day that we constantly prayed about. It was a day that outside of inviting people and talking about it was completely out of our control. It was a day that we were excited and anxious about. It was a day that we poured our hearts into because it was helping kids we love and a place we are homesick for. It was a day that was completely up to God to do his thing and show up in whatever way he wanted. Over the last few weeks I’ve felt a lot of things about that day. I’ve been sad that we didn’t raise more money than we did. I’ve been frustrated that people got all excited about it and then didn’t come. I’ve judged people at how easy this was to do. My heart and sometimes my mouth have said, “All you had to do was come eat ice cream. How much easier does it get! ?” I’ve been mad that God didn’t show up bigger. I’ve felt defeated. I’ve been focused on all of the things that didn’t happen. I’ve been forgetting that Dustin and I (with the help of Adam and Karen) got to do something really cool that day. We got to see our “yes” to God play out. We got to tell people all about Know Think Act, what they do, where and why they do it. We got to see random strangers give money to a cause they just learned about. We got to see parents telling their kids about other kids who don’t have parents. We got to tell kids what an orphanage is and why we were doing this. We got to watch as kids tell their parents they wanted to help and give money. We got to spend the evening with sweet friends and family who took the time out of their week to come and support Know Think Act, not because it’s necessarily something they are passionate about but because it’s something we are passionate about. We got to be a part of something so much bigger than ourselves for one day. As I’ve been processing why I feel the way I do about the fundraiser, I have felt God nudge me towards the fact that saying “yes” to God doesn’t always mean we are going to get what we want. If I had gotten what I wanted all of Nashville and especially all of our friends would have been there that night. If I had gotten what I wanted we would have exceeded the money amount and had to pick a new project. But at the end of the day it doesn’t matter what I wanted. It matters that my “yes” is still “yes” no matter what the outcome is. That when I am involved in something bigger than myself there isn’t any room for judgement or negativity because it wasn’t about me in the first place. Saying “yes” to God isn’t about God moving the same way in other people’s lives as he is in mine. What is important is that I am faithful to the call he has placed on mine (and Dustin’s) hearts no matter what. So, I first want to say sorry. Sorry that this post is so long overdue. Sorry that we had some stuff to work out in our hearts before we could even say a simple thank you. Sometimes life is silly like that. Now we can say… THANK YOU. Thank you to the people who came to the fundraiser. Thank you to the people who didn’t come but still gave money. Thank you to the random strangers who filled up a jar full of dolla dolla bills y’all. (No? Okay.) Thank you to Know Think Act for being an organization worth doing a fundraiser for. Thank you for being a part of our story. We’re still trying to finish up the Christmas clothes project. If you’d like to help, here is the link. We’re half way there!